Acting Town Clerk, Sharon Harry-Munroe holding bound copies of handwritten records of the Georgetown City Council. 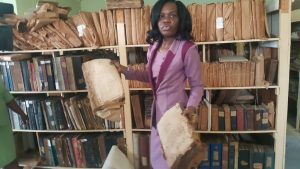 Historical records of Guyana’s capital, Georgetown, dating back to the 1800s, are being poorly stored and vulnerable to termites and water damage. 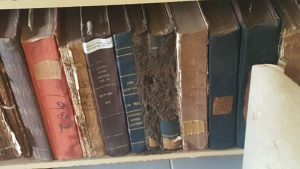 A visit to the abandoned and dilapidated Municipal Constabulary Training School, Water Street by Chairman of the Commission of Inquiry into the operations of the City administration, Retired Justice Cecil Kennard and Legal Officer, Sherwin Benjamin revealed that the records are being poorly stored in a room downstairs. Some of the material were wrapped in separated packages and stored on shelves, as evidence that some curation had been done. Others were in files and appeared to be slowly deteriorating. Bound copies of some documents appeared to have been affected termites such as ‘wood ants’. Some of the minutes of Council Meetings are handwritten, an indication of how far back they date. Experts say decades-old handwritten records should be stored between acid-free paper to minimise deterioration. Termite-affected minutes of the Georgetown City Council believed to be dating back to the 1960s. They include records of when late Presidents Janet Jagan and Forbes Burnham served as City Councillors, employee records, applications by citizens for works approval, employment records, and records of Council meetings. The National Archivist or his representative may examine public records which have not been transferred to the National Archives and select those he believes should be preserved and transferred. Public records, according to the law, includes those at a local government office. Pieces of documents and building plans were also strewn on the floor of the room that, in part, looked like a ‘dump’ for old computers and other equipment. 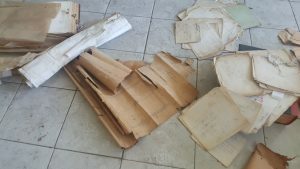 Acting Town Clerk, Sharon Harry-Munroe told reporters that none of the records, including “bounded copies of minutes of old Georgetown”, is missing but they were being stored at the water-logged Training School which is “disrepair”. Building plans and other material strewn of the floor of a room at the Municipality’s City Constabulary Training School. The building has been abandoned due to its state of disrepair. She assured that plans were being made to rehabilitate the Training School’s storage area for the documents or transfer them elsewhere “to revive them”. “We used to have it done and I think it’s part of the preservation of the City we have and there is a lot of information that is actually there that we can share with the members of the public and we will revive it,” she said. Harry-Munroe said in the past the Public Relations Department had assisted in the preservation of the material and now there was need to train more persons. The Acting Town Clerk said City Hall might “very well” hand over the historical records to the National Archives.